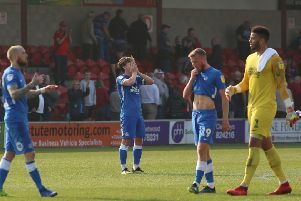 Danny Lloyd (right) leads the Posh celebrations after the third goal in a 3-1 win at Aston Villa. Photo: Joe Dent/theposh.com. Peterborough United’s FA Cup fourth round tie has been selected for live TV coverage. Posh will take on Premier League side Leicester City or fellow League One outfit Fleetwood Town at home, with the match to be played at 12.30pm on Saturday, January 27, live on BT Sport 2. Leicester and Fleetwood will feature in a replay at the King Power Stadium on Tuesday (January 16) to decide who will meet Posh. Posh made it into the fourth round after a 3-1 victory at Championship side Aston Villa.